Masaccio was the first painter in the Renaissance to incorporate Brunelleschi’s discovery, linear perspective, in his art. He did this in his fresco the Holy Trinity, in Santa Maria Novella, in Florence. Have a close look at the painting and at this perspective diagram. 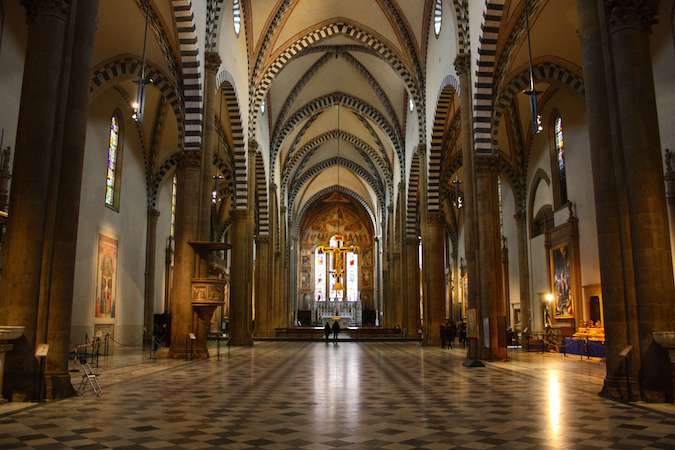 The orthogonals can be seen in the edges of the coffers in the ceiling (look for diagonal lines that appear to recede into the distance). Because Masaccio painted from a low viewpoint, as though we were looking up at Christ, we see the orthogonals in the ceiling, and if we traced all of the orthogonals, we would see that the vanishing point is on the ledge that the donors kneel on. Our favorite part of this fresco is God’s feet. Actually, you can only really see one of them. God is standing in this painting. This may not strike you all that much when you first think about it because our idea of God, our picture of God in our minds eye—as an old man with a beard—is very much based on Renaissance images of God. 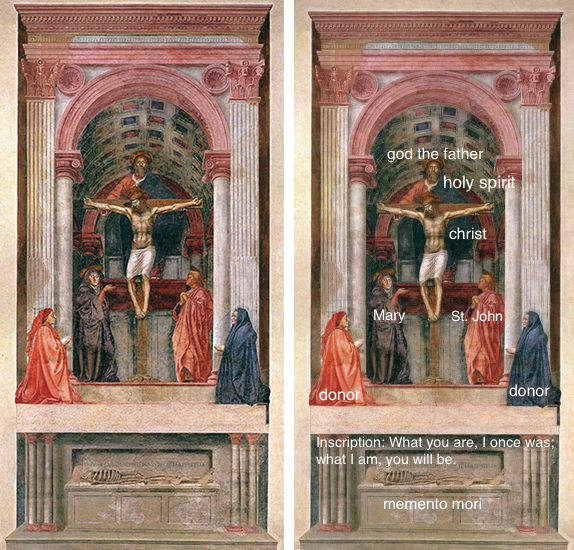 So, here Masaccio imagines God as a man. Not a force or a power, or something abstract, but as a man. A man who stands—his feet are foreshortened, and he weighs something and is capable of walking. In medieval art, God was often represented by a hand, as though God was an abstract force or power in our lives—but here he seems so much like a flesh and blood man. This is a good indication of Humanism in the Renaissance. One of the other remarkable things about this fresco is the use of the forms of classical architecture (from ancient Greece and Rome). Masaccio borrowed much of what we see from ancient Roman architecture, and may have been helped by the great Renaissance architect Brunelleschi. Ionic and Corinthian Capitals – a capital is the decorated top of a column or pilaster. An ionic capital has a scroll shape (like the ones on the attached columns in the painting), and a Corinthian capital has leaf shapes. Cite this page as: Dr. Steven Zucker and Dr. Beth Harris, "Masaccio, Holy Trinity," in Smarthistory, August 9, 2015, accessed April 21, 2019, https://smarthistory.org/masaccio-holy-trinity/.